and it is demanded for proof that every doubt becomes impossible. 120 is the largest number of spheres that can contract a central sphere in eight dimensions. Beyond the fourth dimension, this "kissing number" is only known for the eighth and 24th dimensions. 1006 Chinese and Arabic astronomers noted a supernova. The speed of the still-expanding shock wave was measured nearly a millenium later. This was history's brightest "new star" ever recorded, at first seen to be brighter than the planet Venus. It occurred in our Milky Way galaxy, appearing in the southern constellation Lupus, near the star Beta Lupi. It was also recorded by observers in Switzerland, Italy, Japan, Egypt and Iraq. From the careful descriptions of the Chinese astronomers of how the light varied, that it was of apparently yellow color and visible for over a year, it is possible that the supernova reached a magnitude of up to -9. Modern measurements of the speed of the shock wave have been used to estimate its distance. *TIS The associated supernova remnant from this explosion was not identified until 1965, when Doug Milne and Frank Gardner used the Parkes radio telescope to demonstrate that the previously known radio source PKS 1459-41, near the star Beta Lupi, had the appearance of a 30-arcminute circular shell. to see Mr Short who spoke to me about the difficulty in giving his mirrors a parabolic figure. It is done only by guess-work." which you generalize and perfect." 1891 Nature magazine publishes Peter Guthrie Tait's "The Role of Quaternions in the Algebra of Vectors." 1895 Georg Cantor, in a letter to Felix Klein, explains the choice of aleph for the cardinality of sets. In the same letter he comments that, "the usual alphabets seem to me too much used to be fitter for the purpose. On the other hand, I did not want to invent a new symbol, so I chose finally the aleph, which in Hebrew has also the numerical value 1." Einstein would often say that Kleiner, at first, rejected his thesis for being too short, so he added one more sentence and it was accepted. 1777 Johann Carl Friedrich Gauss (30 April 1777 – 23 February 1855) was a German mathematician and physical scientist who contributed significantly to many fields, including number theory, statistics, analysis, differential geometry, geodesy, geophysics, electrostatics, astronomy and optics. He transformed nearly all areas of mathematics, for which his talent showed from a very early age. For his contributions to theory in magnetism and electricity, a unit of magnetic field has been named the gauss. He devised the method of least squares in statistics, and his Gaussian error curve remains well-known. He anticipated the SI system in his proposal that physical units should be based on a few absolute units such as length, mass and time. In astronomy, he calculated the orbits of the small planets Ceres and Pallas by a new method. 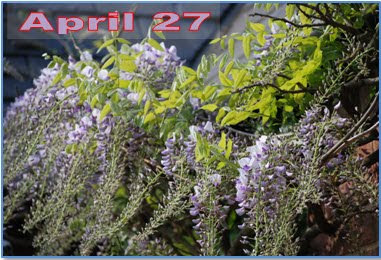 He invented the heliotrope for trigonometric determination of the Earth's shape. With Weber, he developed an electromagnetic telegraph and two magnetometers. 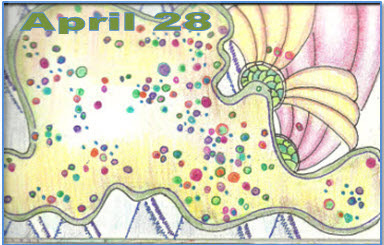 *TIS He proved that the heptadecagon (17 gon) was constructable (see April 8) with straight-edge and compass. Dave Renfro has a complete and elementary proof. 1916 Claude Shannon (30 April 1916 in Petoskey, Michigan, USA - 24 Feb 2001 in Medford, Massachusetts, USA) founded the subject of information theory and he proposed a linear schematic model of a communications system. His Master's thesis was on A Symbolic Analysis of Relay and Switching Circuits on the use of Boole's algebra to analyse and optimize relay switching circuits. *SAU While working with John von Neumann on early computer designs, (John) Tukey introduced the word "bit" as a contraction of "binary digit". The term "bit" was first used in an article by Claude Shannon in 1948. Among several statues to Shannon, one is erected in his hometown of Gaylord, Michigan. The statue is located in Shannon Park in the center of downtown Gaylord. Shannon Park is the former site of the Shannon Building, built and owned by Claude Shannon's father. The lady beside the statue, a true mathematical genius in her own right, is Betty, the wife, and closest collaborator of Claude Shannon. While working with John von Neumann on early computer designs, (John) Tukey introduced the word "bit" as a contraction of "binary digit". The term "bit" was first used in an article by Claude Shannon in 1948. In 2016 as his 100th birth anniversary was approaching, the Petoskey News (Shannon's birthplace) described him as the folks who knew him growing up in Gaylord like to recall him, "Who would have guessed the world would be celebrating the birthday of a unicycling, juggling, mathematic academic and engineer from Gaylord? 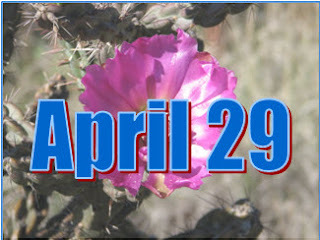 But that is exactly what is happening next week as local historians, youth and others celebrate a special centennial birthday of a local celebrity. 1944 Lee Cecil Fletcher Sallows (April 30, 1944, ) is a British electronics engineer known for his contributions to recreational mathematics. He is particularly noted as the inventor of golygons, self-enumerating sentences, and geomagic squares. Sallows has an Erdős number of 2. This Pangram contains four as, one b, two cs, one d, thirty es, six fs, five gs, seven hs, eleven is, one j, one k, two ls, two ms, eighteen ns, fifteen os, two ps, one q, five rs, twenty-seven ss, eighteen ts, two us, seven vs, eight ws, two xs, three ys, & one z. 1907 Charles Howard Hinton​ (1853, 30 April 1907) was a British mathematician and writer of science fiction works titled Scientific Romances. He was interested in higher dimensions, particularly the fourth dimension, and is known for coining the word tesseract and for his work on methods of visualizing the geometry of higher dimensions. He also had a strong interest in theosophy. Hinton created several new words to describe elements in the fourth dimension. According to OED, he first used the word tesseract in 1888 in his book A New Era of Thought. He also invented the words "kata" (from the Greek "down from") and "ana" (from the Greek "up toward") to describe the two opposing fourth-dimensional directions—the 4-D equivalents of left and right, forwards and backwards, and up and down. Hinton was convicted of bigamy for marrying both Mary Ellen (daughter of Mary Everest Boole and George Boole, the founder of mathematical logic) and Maud Wheldon. He served a single day in prison sentence, then moved with Mary Ellen first to Japan (1886) and later to Princeton University in 1893 as an instructor in mathematics. In 1897, he designed a gunpowder-powered baseball pitching machine for the Princeton baseball team's batting practice. According to one source it caused several injuries, and may have been in part responsible for Hinton's dismissal from Princeton that year. However, the machine was versatile, capable of variable speeds with an adjustable breech size, and firing curve balls by the use of two rubber-coated steel fingers at the muzzle of the pitcher. He successfully introduced the machine to the University of Minnesota, where Hinton worked as an assistant professor until 1900, when he resigned to move to the U.S. Naval Observatory in Washington, D.C.
2011 Daniel Gray "Dan" Quillen (June 22, 1940 – April 30, 2011) was an American mathematician. From 1984 to 2006, he was the Waynflete Professor of Pure Mathematics at Magdalen College, Oxford. He is renowned for being the "prime architect" of higher algebraic K-theory, for which he was awarded the Cole Prize in 1975 and the Fields Medal in 1978. Quillen was a Putnam Fellow in 1959. Science is built up of facts, as a house is with stones. than a heap of stones is a house. 119 is the sum of five consecutive primes (17 + 19 + 23 + 29 + 31). 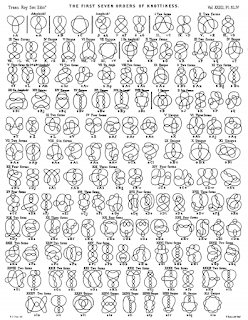 119 is the order of the largest cyclic subgroups of the Monster group. 1831 Weber is offered the position of full professor of Physics at Gottingen to fill the position of Tobias Mayer, partially on the recommendation of Gauss. 1925 The ﬁrst woman, F. R. Sabin, is elected to the National Academy of Sciences (Kane, p. 945). *VFR She was a histology professor at Johns Hopkins University. When (who) was the ﬁrst woman mathematician elected? 1936 Volker Strassen (April 29, 1936 - ) is a German mathematician, a professor emeritus in the department of mathematics and statistics at the University of Konstanz. Strassen began his researches as a probabilist; his 1964 paper An Invariance Principle for the Law of the Iterated Logarithm defined a functional form of the law of the iterated logarithm, showing a form of scale invariance in random walks. This result, now known as Strassen's invariance principle or as Strassen's law of the iterated logarithm, has been highly cited and led to a 1966 presentation at the International Congress of Mathematicians. 1713 Francis Hauksbee the elder (baptized on 27 May 1660 in Colchester–buried in St Dunstan's-in-the-West, London on 29 April 1713. ), also known as Francis Hawksbee, was an 18th-century English scientist best known for his work on electricity and electrostatic repulsion. Initially apprenticed in 1678 to his elder brother as a draper, Hauksbee became Isaac Newton’s lab assistant. In 1703 he was appointed curator, instrument maker and experimentalist of the Royal Society by Newton, who had recently become president of the society and wished to resurrect the Royal Society’s weekly demonstrations. Until 1705, most of these experiments were air pump experiments of a mundane nature, but Hauksbee then turned to investigating the luminosity of mercury which was known to emit a glow under barometric vacuum conditions. By 1705, Hauksbee had discovered that if he placed a small amount of mercury in the glass of his modified version of Otto von Guericke's generator, evacuated the air from it to create a mild vacuum and rubbed the ball in order to build up a charge, a glow was visible if he placed his hand on the outside of the ball. This glow was bright enough to read by. It seemed to be similar to St. Elmo's Fire. This effect later became the basis of the gas-discharge lamp, which led to neon lighting and mercury vapor lamps. In 1706 he produced an 'Influence machine' to generate this effect. He was elected a Fellow of the Royal Society the same year. Hauksbee continued to experiment with electricity, making numerous observations and developing machines to generate and demonstrate various electrical phenomena. 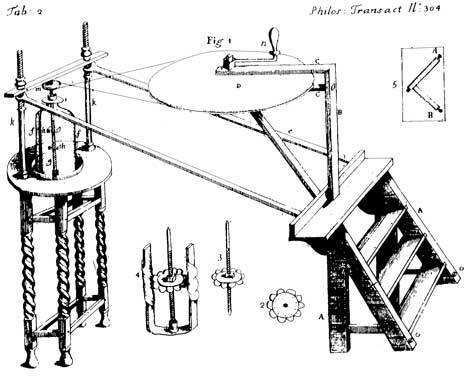 In 1709 he published Physico-Mechanical Experiments on Various Subjects which summarized much of his scientific work. In 1708, Hauksbee independently discovered Charles' law of gases, which states that, for a given mass of gas at a constant pressure, the volume of the gas is proportional to its temperature. 1862 John Edward Campbell (27 May 1862, Lisburn, Ireland – 1 October 1924, Oxford, Oxfordshire, England) is remembered for the Campbell-Baker-Hausdorff theorem which gives a formula for multiplication of exponentials in Lie algebras. *SAU His 1903 book, Introductory Treatise on Lie's Theory of Finite Continuous Transformation Groups, popularized the ideas of Sophus Lie among British mathematicians. 1916 – Jørgen Pedersen Gram (June 27, 1850 – April 29, 1916) was a Danish actuary and mathematician who was born in Nustrup, Duchy of Schleswig, Denmark and died in Copenhagen, Denmark. Important papers of his include On series expansions determined by the methods of least squares, and Investigations of the number of primes less than a given number. The mathematical method that bears his name, the Gram–Schmidt process, was first published in the former paper, in 1883. The Gramian matrix is also named after him. For number theorists his main fame is the series for the Riemann zeta function (the leading function in Riemann's exact prime-counting function). Instead of using a series of logarithmic integrals, Gram's function uses logarithm powers and the zeta function of positive integers. It has recently been supplanted by a formula of Ramanujan that uses the Bernoulli numbers directly instead of the zeta function. Gram was the first mathematician to provide a systematic theory of the development of skew frequency curves, showing that the normal symmetric Gaussian error curve was but one special case of a more general class of frequency curves. 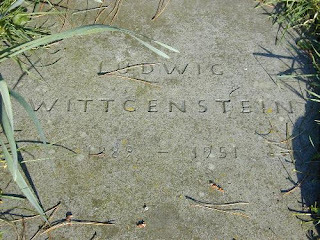 1951 Ludwig Josef Johann Wittgenstein (26 April 1889 – 29 April 1951) was an Austrian-British philosopher who worked primarily in logic, the philosophy of mathematics, the philosophy of mind, and the philosophy of language. He was professor in philosophy at the University of Cambridge from 1939 until 1947. In his lifetime he published just one book review, one article, a children's dictionary, and the 75-page Tractatus Logico-Philosophicus (1921). In 1999 his posthumously published Philosophical Investigations (1953) was ranked as the most important book of 20th-century philosophy, standing out as "...the one crossover masterpiece in twentieth-century philosophy, appealing across diverse specializations and philosophical orientations". Bertrand Russell described him as "the most perfect example I have ever known of genius as traditionally conceived, passionate, profound, intense, and dominating". *Wik He died three days after his birthday. 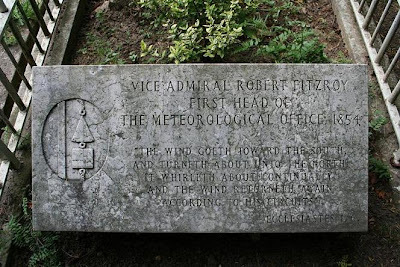 He is buried in a cemetery off Huntington Road in Cambridge, UK. 1970 Paul Finsler (born 11 April 1894, in Heilbronn, Germany,- 29 April 1970 in Zurich, Switzerland)Finsler did his undergraduate studies at the Technische Hochschule Stuttgart, and his graduate studies at the University of Göttingen, where he received his Ph.D. in 1919 under the supervision of Constantin Carathéodory. He joined the faculty of the University of Zurich in 1927, and was promoted to ordinary professor there in 1944. Finsler's thesis work concerned differential geometry, and Finsler spaces were named after him by Élie Cartan in 1934. 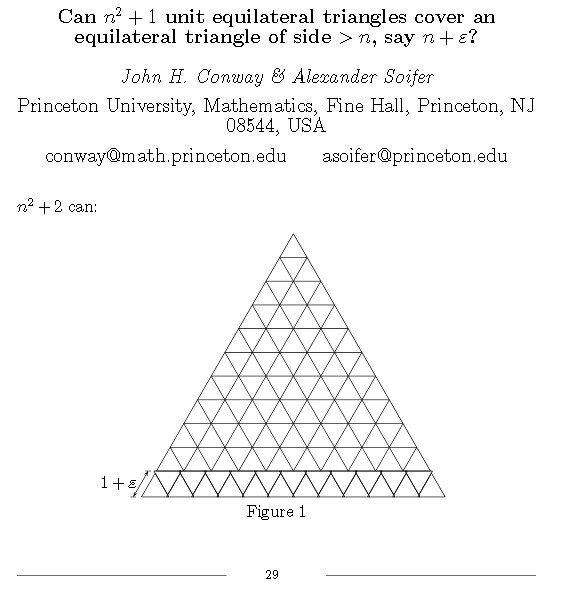 The Hadwiger–Finsler inequality, a relation between the side lengths and area of a triangle in the Euclidean plane, is named after Finsler and his co-author Hugo Hadwiger. Finsler is also known for his work on the foundations of mathematics, developing a non-well-founded set theory with which he hoped to resolve the contradictions implied by Russell's paradox. 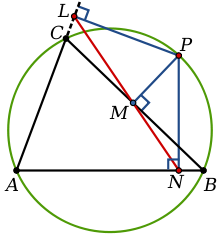 Weitzenböck's inequality can also be proved using Heron's formula, by which route it can be seen that equality holds in (W) if and only if the triangle is an equilateral triangle, i.e. a = b = c.
One of the principal objects of theoretical research in my department of knowledge is to find the point of view from which the subject appears in its greatest simplicity. The 118th day of the year. 118 is the smallest n such that the range n, n + 1, ... 4n/3 contains at least one prime from each of these forms: 4x + 1, 4x - 1, 6x + 1 and 6x - 1. 118 is the smallest even number not differing by one or a prime number from one of its prime neighbors. 1664 Trinity College, Cambridge awards a scholarship to Isaac Newton to study for his Master's Degree, thus ending his period as a lowly sizar earning his tuition by cleaning up after wealthier students. Within months his formal education would be put on hold as the college closed under the assault of the plague. Leibniz was convinced that good mathematical notation was the key to progress so he experimented with different notation for coefficient systems. His unpublished manuscripts contain more than 50 different ways of writing coefficient systems which he worked on during a period of 50 years beginning in 1678. Only two publications (1700 and 1710) contain results on coefficient systems and these use the same notation as in his letter to de l'Hôpital mentioned above. Thanks again to Dave for the corrections. "The piece of Guass's Disquisitiones Arithmeticiae, which is found among Dirichlet's papers, is probably that portion which, as Dirichlet told me himself, he saved from the hand of Gauss when the latter lit his pipe with his manuscript of the Disquisitiones Arithmeticae on the day of his doctoral jubilee." Dedekind reasoned, if Guass had saved the paper for fifty years he obviously valued it, and that if the anecdote were true, Dirichlet surely would have shared it with him as well. 1765 Sylvestre François Lacroix (April 28, 1765, Paris – May 24, 1843, Paris) was a French mathematician. He displayed a particular talent for mathematics, calculating the motions of the planets by the age of 14. In 1782 at the age of 17 he became an instructor in mathematics at the École Gardes de Marine in Rochefort, France. 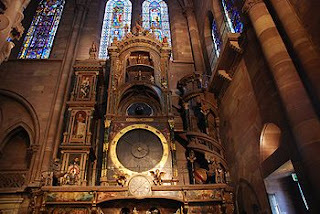 He returned to Paris and taught courses in astronomy and mathematics at the Lycée. In 1787 he was the co-winner of that year's Grand Prix of the French Académie des Sciences, but was never awarded the prize. The same year the Lycée was abolished and he again moved to the provinces. In Besançon he taught course in mathematics, physics, and chemistry at the École d'Artillerie. In 1793 he became examiner of the Artillery Corps, replacing Pierre-Simon Laplace in the post. By 1794 he was aiding his old instructor, Gaspard Monge, in creating material for a course on descriptive geometry. In 1799 he was appointed professor at the École Polytechnique. Lacroix produced most of his texts for the sake of improving his courses. The same year he was voted into the newly formed Institut National des Sciences et des Arts. In 1812 he began teaching at the Collège de France, and was appointed chair of mathematics in 1815. 1773 Robert Woodhouse (28 April 1773 – 23 December 1827) was an English mathematician. He was born at Norwich and educated at Caius College, Cambridge, (BA 1795) of which society he was subsequently a fellow. He was elected a Fellow of the Royal Society in December 1802. His earliest work, entitled the Principles of Analytical Calculation, was published at Cambridge in 1803. In this he explained the differential notation and strongly pressed the employment of it; but he severely criticized the methods used by continental writers, and their constant assumption of non-evident principles. This was followed in 1809 by a trigonometry (plane and spherical), and in 1810 by a historical treatise on the calculus of variations and isoperimetrical problems. He next produced an astronomy; of which the first book (usually bound in two volumes), on practical and descriptive astronomy, was issued in 1812, and the second book, containing an account of the treatment of physical astronomy by Pierre-Simon Laplace and other continental writers, was issued in 1818. He became the Lucasian Professor of Mathematics in 1820, and subsequently the Plumian professor in the university. As Plumian Professor he was responsible for installing and adjusting the transit instruments and clocks at the Cambridge Observatory. He held that position until his death in 1827. 1774 Francis Baily (28 April 1774 – 30 August 1844) was an English astronomer. 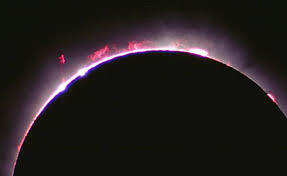 He is most famous for his observations of 'Baily's beads' during an eclipse of the Sun. Bailey was also a major figure in the early history of the Royal Astronomical Society, as one of the founders and president four times. Baily was born at Newbury in Berkshire in 1774 to Richard Baily. After a tour in the unsettled parts of North America in 1796–1797, his journal of which was edited by Augustus de Morgan in 1856, Baily entered the London Stock Exchange in 1799. The successive publication of Tables for the Purchasing and Renewing of Leases (1802), of The Doctrine of Interest and Annuities (1808), and The Doctrine of Life-Annuities and Assurances (1810), earned him a high reputation as a writer on life-contingencies; he amassed a fortune through diligence and integrity and retired from business in 1825, to devote himself wholly to astronomy. 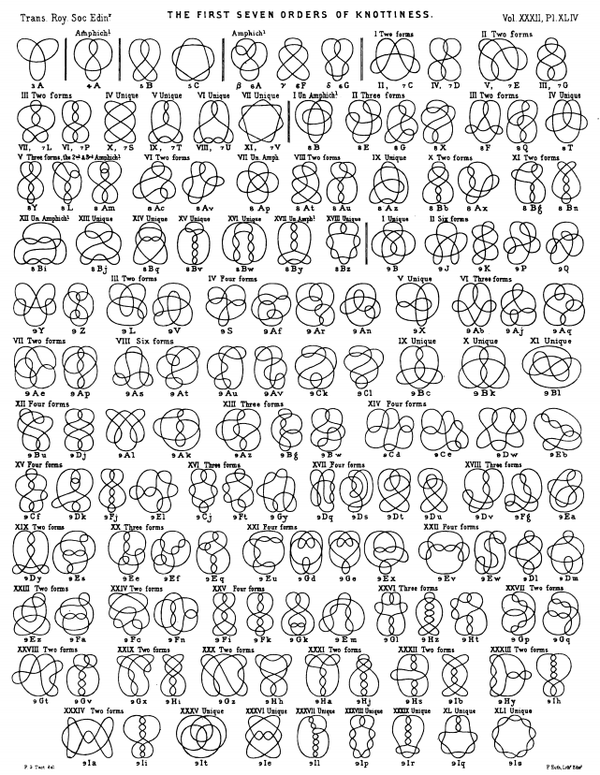 Below is The First Seven Orders of Knottiness"-table compiled by P.G. Tait in 1884 with a big hat-tip to Ben Gross@bhgross144 . 1854 Phoebe Sarah Hertha Ayrton (28 April 1854 – 23 August 1923), was a British engineer, mathematician, physicist, and inventor. Known in adult life as Hertha Ayrton, born Phoebe Sarah Marks, she was awarded the Hughes Medal by the Royal Society for her work on electric arcs and ripples in sand and water. In 1880, Ayrton passed the Mathematical Tripos, but Cambridge did not grant her an academic degree because, at the time, Cambridge gave only certificates and not full degrees to women. Ayrton passed an external examination at the University of London, which awarded her a Bachelor of Science degree in 1881. 1923 Fritz Joseph Ursell FRS (28 April 1923 – 11 May 2012) was a British mathematician noted for his contributions to fluid mechanics, especially in the area of wave-structure interactions. He held the Beyer Chair of Applied Mathematics at the University of Manchester from 1961–1990, was elected Fellow of the Royal Society in 1972 and retired in 1990. 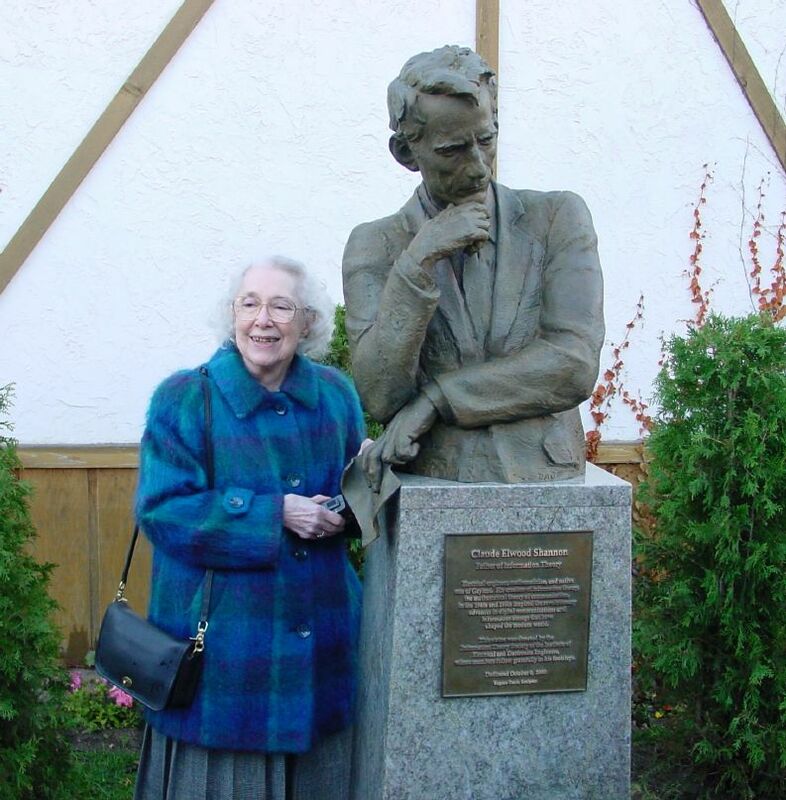 Mary Sommerville was one of his students. He succeeded John Playfair as Math Chair in Edinburgh. He also invented a complicated type of pantograph called the eidograph. 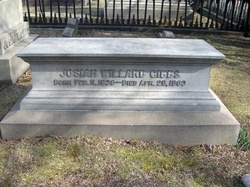 He is buried at the Grove Street Cemetery in New Haven Connecticut, USA. 1946 Louis Jean-Baptiste Alphonse Bachelier (March 11, 1870 – April 28, 1946) was a French mathematician at the turn of the 20th century. He is credited with being the first person to model the stochastic process now called Brownian motion, which was part of his PhD thesis The Theory of Speculation, (published 1900). 1986 R H Bing (October 20, 1914, Oakwood, Texas – April 28, 1986, Austin, Texas) He wrote papers on general topology, particularly on metrization; planar sets where he examined in particular planar webs, cuttings and planar embeddings. He worked on topological classification of the 2-sphere, the 3-sphere, pseudo arcs, simple closed curves and Hilbert space. He studied partitions and decompositions of locally connected continua. He considered several different aspects of 3-manifolds including decompositions, maps, approximating surfaces, recognizing tameness, triangulation and the Poincaré conjecture. *SAU Oakwood had a population of 471 at the 2000 census. 1991 Paul Ernest Klopsteg (May 30, 1889 – April 28, 1991) was an American physicist. The asteroid 3520 Klopsteg was named after him and the yearly Klopsteg Memorial Award was founded in his memory. He performed ballistics research during World War I at the US Army's Aberdeen Proving Grounds in Maryland. He applied his knowledge of ballistics to the study of archery. 1999 Arthur Leonard Schawlow (May 5, 1921 – April 28, 1999) was an American physicist. He is best remembered for his work on lasers, for which he shared the 1981 Nobel Prize in Physics with Nicolaas Bloembergen and Kai Siegbahn. In 1991 the NEC Corporation and the American Physical Society established a prize: the Arthur L. Schawlow Prize in Laser Science. The prize is awarded annually to "candidates who have made outstanding contributions to basic research using lasers." In 1951, he married Aurelia Townes, younger sister to physicist Charles Hard Townes, and together they had three children; Arthur Jr., Helen, and Edith. Arthur Jr. was autistic, with very little speech ability. Schawlow and Professor Robert Hofstadter at Stanford, who also had an autistic child, teamed up to help each other find solutions to the condition. Arthur Jr. was put in a special center for autistic individuals, and later Schawlow put together an institution to care for people with autism in Paradise, California. It was later named the Arthur Schawlow Center in 1999, shortly before his death on the 29th of April 1999. I believe that we do not know anything for certain, but everything probably. 1865 King George V of Hanover visited Gottingen and ordered a commemorative plate placed at the room in which Gauss had died ten years before. 1961 Patent issued for multilayer circuit boards. Hazeltyne, a US firm, patented hole technology and its use in multi-layer printed circuit board assemblies. The result was that component density increased, and the newly close-spaced electrical paths changed the design of printed circuit board assemblies dramatically. 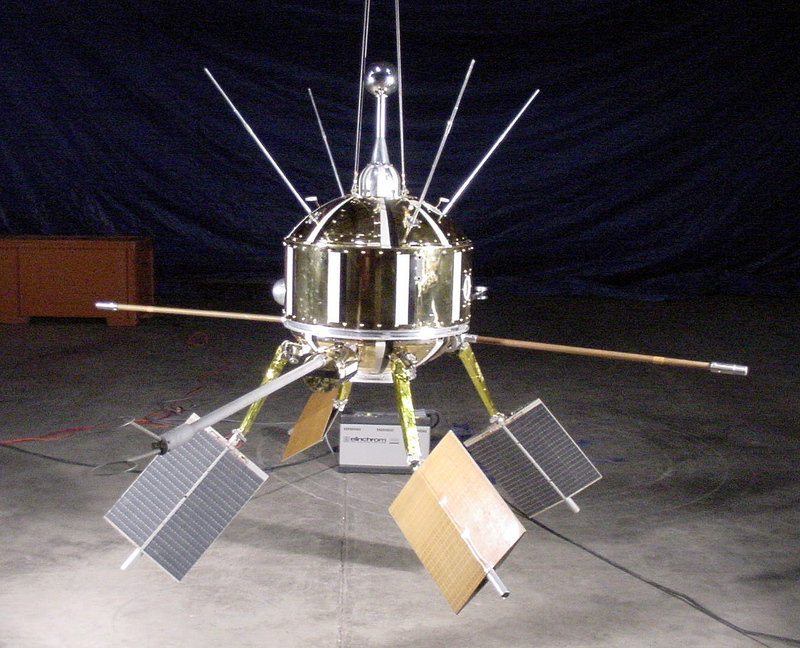 2002 The last successful reception of telemetry was received from Pioneer 10 on April 27, 2002; subsequent signals were barely strong enough to detect, and provided no usable data. Pioneer 10 was launched in 1972 . Pioneer 10 crossed the orbit of Saturn in 1976 and the orbit of Uranus in 1979. 1843 Felix Muller He compiled the earliest mathematical calendar (that I know of)*VFR. Interests were in the history of mathematical terminology. His advisors were Weierstrass and Kummer. 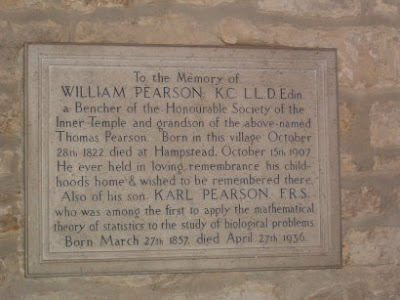 1936 Karl Pearson, (27 March 1857 in London, England - 27 April 1936 in Coldharbour, Surrey, England) English mathematician, one of the founders of modern statistics. Pearson's lectures as professor of geometry evolved into The Grammar of Science (1892), his most widely read book and a classic in the philosophy of science. Stimulated by the evolutionary writings of Francis Galton and a personal friendship with Walter F.R. Weldon, Pearson became immersed in the problem of applying statistics to biological problems of heredity and evolution. The methods he developed are essential to every serious application of statistics. From 1893 to 1912 he wrote a series of 18 papers entitled Mathematical Contributions to the Theory of Evolution, which contained much of his most valuable work, including the chi-square test of statistical significance. *TIS l There is a plaque in the church at Crambe in No. Yorkshire where he was born and many of his family are buried. 1978 Guido Stampacchia (March 26, 1922 - April 27, 1978) was a 20th century mathematician. Stampacchia was active in research and teaching throughout his career. He made key contributions to a number of fields, including calculus of variation and differential equations. In 1967 Stampacchia was elected President of the Unione Matematica Italiana. It was about this time that his research efforts shifted toward the emerging field of variational inequalities, which he modeled after boundary value problems for partial differential equations. Impress your History teacher, the 100 Years war between France and England..... lasted 116 years. and Jiroemon Kimura died in 2013 in Japan. He was 116 years old. Two years later his record was broken by an even older Japanese citizen who died. And for a bit of Americana, from a British web site called *isthatabignumber.com.. 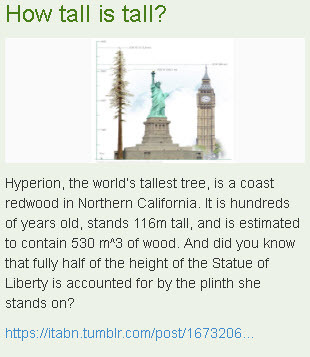 It's about Hyperion, a tree that is 116 meters tall. 1760 Euler was asked to tutor the niece of Frederick the Great, the Princess of Anhalt-Dessau. Euler wrote over 200 letters to her in the early 1760s. On this date he sent the third of these letters. The letter covered the physics of sound and he gave a speed of one thousand feet per second. He closes by telling the Princess that we are incapable of hearing a string vibrating at less than 30 vibrations per second, or one that is more than 7552 vibrations per second. 1861 Richard Owen gives the longest ever discourse at a Royal Institution lecture, ‘On the Scope and Appliances of a National Museum of Natural History’. 1920 Shapley and Curtis debate the nature of the nebulae. In astronomy, the Great Debate, also called the Shapley–Curtis Debate, was an influential debate between the astronomers Harlow Shapley and Heber Curtis which concerned the nature of spiral nebulae and the size of the universe. more here. Radio Station WEW, the original radio station of Saint Louis University, played an important role in the history of early radio. In 1921 it became only the second radio station in the U.S. and the first station west of the Mississippi River. In 1939 it became the first station to broadcast Sacred Heart Radio, a Catholic religious program which eventually grew to include over a thousand stations around the world. Finally, in 1947 WEW became the first FM radio station in St. Louis. 1968 Time magazine (p. 41) reports a “Trial by Mathematics” in which a couple was convicted on the basis of mathematical probability. Later the reasoning was found to be incorrect. The discussion there is of interest. 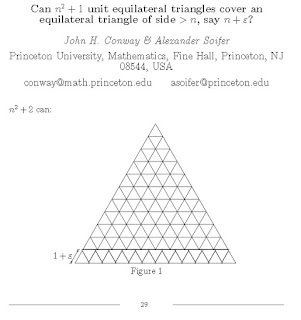 See also Journal of Recreational Mathematics, 1(1968), p. 183. 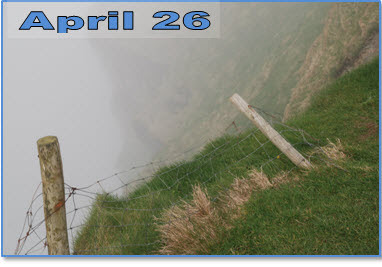 *VFR See details here. 1985 A 22-cent commemorative stamp for Public Education in America issued in Boston. 1986 Nuclear reactor number 4 at Chernobyl, USSR, exploded and released a large amount of radioactive material into the atmosphere. [A. Hellemans and B. Bunch. The Timetables of Science, p. 597]. 1938 Manuel Blum (26 April 1938; Caracas, Venezuela -) is a computer scientist who received the Turing Award in 1995 "In recognition of his contributions to the foundations of computational complexity theory and its application to cryptography and program checking". Blum attended MIT, where he received his bachelor's degree and his master's degree in EECS in 1959 and 1961 respectively, and his Ph.D. in Mathematics in 1964 under professor Marvin Minsky. He worked as a professor of computer science at the University of California, Berkeley until 1999. In 2002 he was elected to the United States National Academy of Sciences. 1902 Lazarus Immanuel Fuchs (5 May 1833 – 26 April 1902) was a German mathematician who contributed important research in the field of linear differential equations. He was born in Mosina (located in Grand Duchy of Poznań) and died in Berlin, Germany. This story has become famous, but the rest of the conversation isn’t as well known. Hardy followed up by asking Ramanujan what the corresponding number would be for 4th powers. Ramanujan replied that he did not know, but that such a number must be very large. His readers seem to find that Euler was correct. No suprise there. His History of analytic Geometry is excellent. 1980 Stanisław Gołąb (July 26, 1902 – April 30, 1980) was a Polish mathematician from Kraków, working in particular on the field of affine geometry.